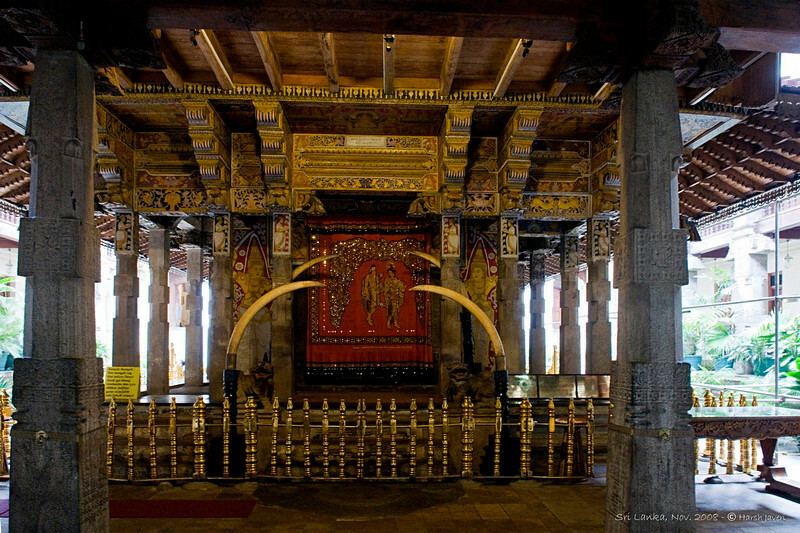 The Temple of Tooth, also known as Dalda Maligawa, is one of the most sacred Buddhist pilgrimage sites in the world. Here, one of the Buddha's teeth is kept. The temple was built in the 17th century. A golden canopy has been added recently. This was another difficult shot with a strong light on sides and very low in the sanctum. WOW! totally AWESOME and INSPIRING. The history addition is always welcomed and enjoyed along with your pictures! As the English would say: 'Plendid job, chap!" Nice capture...I was wondering what was outside on the right side...looks intriguing. Lovely shot -- and very interesting information to go with it. What a gorgeous temple.. made so much more so by your beautiful shot..Lovely..